UPDATE—WINNERS: Lucky 13…today has been declared official bloom date! Only guesses submitted by 2:00pm today June 13, 2012 will be taken in consideration. Email us at communications@moodygardens.com if we reply to your comment with “WINNER” to claim your prize. Thank you all for your guesses! Morticia, the Corpse Flower, looks like she’s ready for her bloom! But without a set blooming season, it’s hard to predict when the Corpse Flower will bloom. So who “nose” when the Corpse Flower will bloom and begin its silent and smelly flowering? The first 20 people to guess correctly will win a free ticket to the Rainforest Pyramid to see Morticia! A Corpse Flower bloom occurs when the spadix, the long, French bread-like stem, emerges from the bud. At that point, the flower will grow four to six inches a day and the strong smell will start to roll in. The strong smell that is similar to rotting flesh attracts its pollinators, carrion beetles and sweat flies. It is considered the largest flowering plant in the world, often reaching heights of over 10 feet tall. Technically, it is the largest unbranched inflorescence, containing both male & female flowers. The Corpse Flower grows from an underground tuber which can weigh up to 200 pounds. From this tuber, a large single leaf emerges resembling a small tree that can grow to more than 20 feet tall. During this vegetative state, the tuber gains its energy to produce the massive bloom. The plant then goes into a dormant period for approximately three months. The tuber will then either produce another leaf or a flower as it has at Moody Gardens. Once fully unfurled, the flower will only last for a day or two. Then the flower collapses upon itself and withers away. The tuber will then go into a dormant period, resting and gaining energy, eventually sending up another tree trunk-like stalk, beginning the incredible process all over again! The Corpse Flower is under threat of extinction in the wild due to illegal logging and the clearing of rain forest land for cultivation of oil palm plantations. It is our hope that interest in and appreciation of our Earth’s amazing plants and animals will lead to increased efforts at conserving the habitats of these and other rare species. While you’re at it, why not go ahead and like us on Facebook and/or follow us on Twitter. This promotion is in no way sponsored, endorsed or administered by, or associated with, Facebook, Inc. Any comments that are inappropriate, offensive, spam or commercial in nature can be deleted by the page admin. Must be 18 years or older to win. 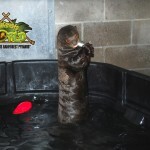 You “otter” see this! Come meet the newest residents of Moody Gardens® when life emerges on May 28th at the Rainforest Pyramid®. 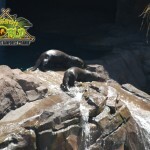 On your adventure you’ll meet Dru, Ella and Yzma, three Giant Otters (Pteronura brasiliensis) who came to Moody Gardens® on December 17 of last year. Giant Otters are a carnivorous mammal native to South America and found mostly in the Amazon River and the Pantanal, which is an area of tropical wetland in Brazil. Otters are members of the weasel family (Mustelidae) and have the longest body length in the species. In some cases, males have reached reported lengths of over seven feet. Males in general will be about 4.9 to 5.9 feet, while females will reach lengths of about 4.9 to 5.6 feet. These noisy mammals have the shortest fur of all otter species and it’s usually chocolate-brown, reddish or fawn in coloration. This fur is extremely dense so much so that water cannot penetrate to the skin. Guard hairs trap water and keep the inner fur dry. These hairs are about one third of an inch long and are twice as long as the fur of the inner coat. Giant Otters also have unique markings of white or cream colored fur on the throat and under the chin, which allows individuals to be identified from birth. It is believed that these markings are used by the otter to identify each other. When meeting each other for the first time, otters will engage in a behavior known as “periscoping”. When “periscoping”, otters will pop their heads and chests out of the water to display their markings to the other. They are also characterized by their small, rounded ears and their short and stubby legs that end in large webbed feet equipped with very sharp claws that help them catch prey. Giant Otters also have highly sensitive whiskers (vibrissae) that track changes in water pressure and currents, which aids in detecting prey. 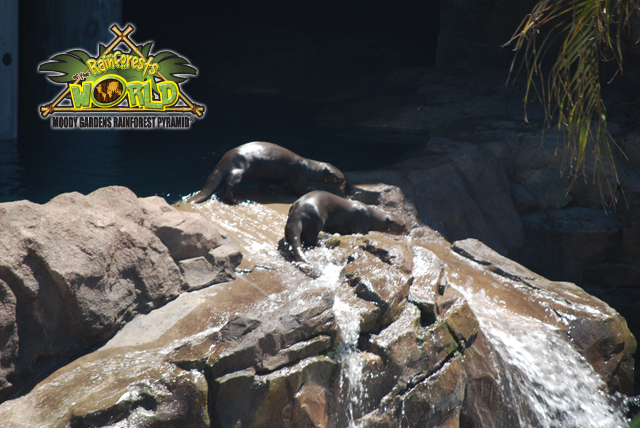 Giant Otters are diurnal, which means they are active exclusively during daylight hours. They are excellent hunters and have extremely keen senses of smell and sight. They are apex predators, meaning they have no serious natural enemies. 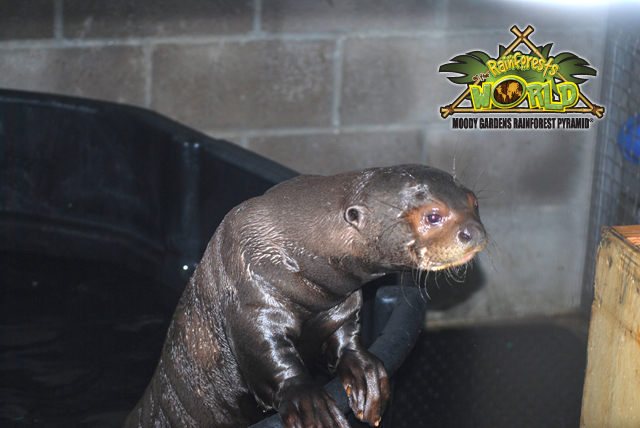 A Giant Otter’s diet usually consists of fish, but they have also been known to eat crabs, snakes and even small Caimans. These natives of South America like to talk too. They are the noisiest of any otter species and they have vocalizations that indicate alarm, aggressiveness and reassurance just to name a few. This species of otter is unusually social for a member of the weasel family. In Spanish, they are known as Lobos Del Rio(Wolves of River) and Perro de Agua (Water Dog) because they live and hunt in packs like canines. They can live in groups of anywhere from two to twenty, but the average group size is three to eight. These groups are strongly cohesive. Members will sleep, play, travel and feed together. Group members will share roles, structured around a dominant breeding pair. This species is highly territorial and they will mark their territory with latrines, gland secretions and vocalizations. Dens are built into the riverbanks and are usually equipped with multiple entrances and chambers. After a 65-70 day gestation period, females will give birth to around one to five pups. After two years the young otters reach full maturity and will leave the family group permanently. Giant Otters have been categorized as endangered by the International Union for Conservation of Nature (IUCN) since 1999 as a result from poaching and loss of habitat. 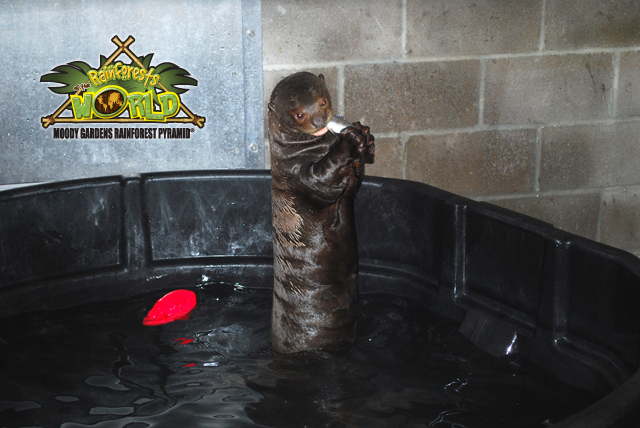 Moody Gardens® is one of six zoos and aquariums in North America that feature Giant Otters. Rodrigues Fruit Bats have made their way to Moody Gardens! 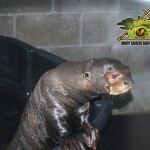 This fun and interesting species will be on exhibit in the Bat Habitat inside the newly enhanced Rainforest Pyramid, which opens in May 2011. The multi-level Bat Habitat will offer viewing opportunities, from the new Rainforest Canopy Walkway down into a subterranean cave environment. The species currently numbers just a few hundred in the wild and is classified as critically endangered!